The U.S. economy enjoyed robust growth in 2018, exceeding the expectations of many experts. And it was the determined American truck driver that kept goods and materials moving. Prosperity in manufacturing, import-export, and other sectors meant growth for truckers as well throughout the trucking industry. The demand for freight deliveries, coupled with a driver shortage, has prompted wages and salaries to rise. 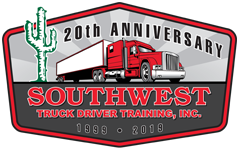 As an industry that can almost certainly offer people of all ages a good-paying job, the trend to enroll in Class A and B CDL training continues to prove fruitful for hard-working Americans. That was 2018. What can we expect in 2019? Read on to get an idea of some of the trucking trends experts project for 2019. According to sources such as the Journal of Commerce (JOC), streamlined logistics will help take some of the pressure off of rising costs that companies experienced in 2018. “With contract rates due to rise 3 percent to 8 percent next year, a top-notch shipper can save 5-cents to 10-cents per mile over its competitors,” the JOC reportedly states. Along with upgrades in technological tracking and scheduling, companies are expected to plan their freight needs further in advance. The economic surge in 2018 caused logistics leaders to rethink giving trucking outfits notice as short as 48 hours and swallowing the higher quick turnaround costs. Manufacturing plants have already begun adopting an advanced notification policy of up to one week to curb price upticks. According to the FTR, volume increased by 5 and 10 percent across the board and upwards of 98 percent of all trucks were in use during 2018. He also floated the idea that economic growth doesn’t wither away. The end to economic growth generally has a specific cause. Although there are plenty of naysayers claiming another recession appears imminent, the recently announced USMCA deal that would replace NAFTA and trade negotiations with China and others could spell sustained economic expansion. Other economists tend to agree with Costello. “My model is that 2019 is essentially going to be a sequel of 2018 – with a caveat: sequels are almost never as good as the original,” says FTR senior economist Bill Witte. Other potential growth could also come out of Washington, D.C. If the two major parties can come to an agreement on a multi-billion dollar infrastructure deal, there could be significant incentives for truck driver training to overcome the worker shortage. Statisticians do not necessarily agree on how large of a trucker shortage the country is experiencing. Some estimate that it could be as low as 60,000. Others put the worker shortage closer to 100,000. Regardless of which industry resource you check, a severe and persistent driver shortage exists. That shortfall of able-bodied men and women to haul freight will likely only get worse as demand increases during 2019 and beyond. One factor expected to exacerbate the problem is the fact that many Baby Boomers are retiring from life on the road. That could mean newcomers to the trucking lifestyle are likely to enjoy improved working conditions, better technology, more comforts in rigs, and higher salaries and benefits. It’s no secret that companies are in fierce competition for skilled CDL drivers. That puts workers in a terrific position to potentially earn signing bonuses or get freight outfits to invest in CDL training and other expenses. Simply put, drivers can expect better perks in 2019. Regulatory Issues: The Federal Motor Carrier Safety Administration reportedly granted the ATA’s petition to preempt conflicting state and federal meal-rest rules. ELDs: These devices appear to be permanent and drivers are urged to replace automatic onboard recording devices with the new fixtures ASAP. Electric Trucks: Development of e-mobility made substantial gains in 2018 and electric trucks are expected to enjoy a more significant profile in Class 3-8 freight transport in 2019. Autonomous Trucks: The automotive industry continues to dabble with the technology. Last year, experiments did not show promise in replacing CDL-level operators. However, Volvo and Mercedes made strides with cargo vans, to some degree. Other factors that are expected to influence the trucking industry include the rise of online shopping. Amazon and other platforms continue to outpace brick and mortar retail outlets and increase the need for doorstep delivery services. This shift appears to be underscoring the need for local, regional and dedicated route drivers among other driving career positions.